Performs full examination of mechanical, chemical and metallographic properties of steel and metallic materials and input raw materials in general. 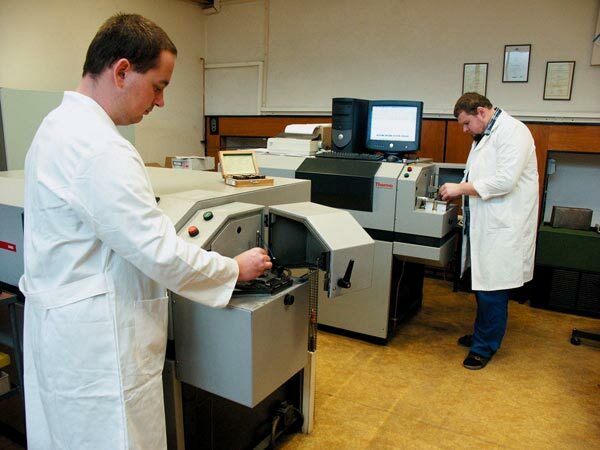 Laboratories are owners of the accreditation certificates pursuant to the ČSN EN ISO/IEC 17025 standard and are included into the system certified by ISO 9001, members of an international association of measuring, testing and analytical labs Eurolab-cz, members of Czech Laboratories Association and testing facilities with audited activities, while they attend interlaboratory comparison tests regularly for the purpose of securing the highest possible quality of their results. – Metallographic evaluation (evaluation of micropurity of the steel, grain size and microstructure, setting of the depth of chemically and thermally processed layers and depth of decarbonization, microhardness measuring, alloy analysis, setting of resistance against intercrystal corrosion, macrostructure documentation, checking of macrostructure by deep etching, evaluation of fracture areas, determination of Delta-Ferrit, measurement of thickness of plated layers, thermal processing of laboratory samples). 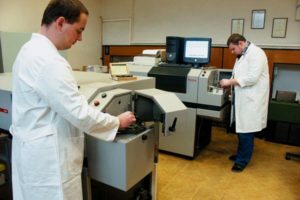 All the above mentioned tests are performed according to respective standards (ČSN, DIN, ASTM…) and technical and supply conditions, set by the customer.